Depression can be tough, it can lead you to feel helpless, lost, alienated, and alone. Many of us feel sad from time to time for one reason or another, but depression is like extreme, prolonged sadness, which can leave you feeling empty and irritable. Even when there is no instigator to your sorrow, it may strike and cause both mental and physical impairment. You may be asking–how do I know if I'm depressed not just sad? This article will help you to ascertain the difference, and provide tips on how to cope with depression. This is one of the main symptoms of depressions. If you find that you consistently feel hopeless without worth, or guilty without cause, then you could be suffering from depression. If remedial occurrences during everyday life lead your emotions to go into overload, causing you to cry, or even have outbursts of anger for little to no reason, then depression could be the cause of your anguish. If you no longer find things that you used to enjoy fun or exciting, or losing interest in activities that once defined you, then it may be due to depression. When asking--how do I know if I'm depressed? Another symptom that may be an indication of depression is having difficulty in making decisions.If you are also experiencing loss of memory or extreme forgetfulness, then it may be wise to consult a health care professional. A depressed mood, persistent anxiety, numerous instances of crying, or even a rage of anger, all of these occurrences can lead to tiredness and fatigue. Depression may also cause disturbance to your sleeping pattern, which will almost certainly contribute to feelings of tiredness and fatigue. When living with depression, your thoughts and feelings can be so strong that they impair your ability to carry out normal daily tasks. And it even could interfere with your work and life. This is an extremely serious symptom. If you have ever considered any of these thoughts then please remember that there is help out there for everyone, and that feelings of depression and sadness, no matter how extreme, will eventually pass with time. 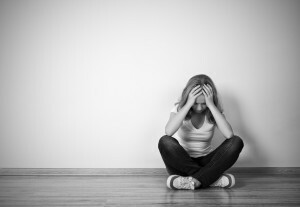 There are numerous instances which can lead you to feel depressed. These include feelings of isolation or lacking social connection. Grief from loss of a loved one or loss of a job, can lead to depression, as well as if you feel as though your life has no meaning, have high amounts of stress in your life, or an inner voice which criticizes your every move. More importantly, if you are unable to deal with these emotions in a rational way, then depression may soon ensue. When asking--how do I know if I'm depressed? Knowing what can lead to depression is important. Certain lifestyle choices can cause extreme feelings of sadness and depression, such as lack of exercise, consuming a poor diet without nutritious foods, spending little to no time in nature, and consistently working without rest can all lead to depression. It is thought that establishing a daily routine can help to battle feelings of depression. Whether this works to take your mind off of your feelings, or to reestablish a connection between yourself and your life, setting a routine may prove beneficial. Feelings of depression can lead you to find difficulty in performing everyday tasks. Setting goals, even simple goals, and achieving them can help to instill feelings of accomplishment, which can help to relieve feelings of depression. When you exercise, endorphins are released. This chemical provides you with a vitalizing boost of feeling good energy. Regular exercise can also help in the long term, by not only setting and maintaining a routine, but also by encouraging healthy thoughts and feelings. There is some evidence to suggest that omega-3 fatty acids and folic acid, found in fish like salmon and vegetables like spinach respectively, can help with feelings of depression. It can be hard for those with depression to get adequate sleep. Unfortunately, this would only make the condition worse. Try to maintain a good sleeping pattern, go to sleep at a reasonable time each night, have no electronic devices in your bedroom, and avoid napping throughout the day. During times of depression, it can be easy to disregard all of your responsibilities either at work or in a relationship. You should try to maintain these responsibilities, as they can help you to hold on to your normal lifestyle, give you a feeling of accomplishment, and help battle depression. Depression can leave you feeling as though there is no excitement in your life. Trying something new can help to restore your excitement in life. Challenging oneself can help to stimulate dopamine within the brain, which is linked to feelings of happiness, enjoyment, pleasure, and learning. If you can, try to have some fun. Carry out activities you enjoy, reassume old hobbies you stopped years ago, even if you feel unable to have fun at first, keep trying. The next time you seem to have a negative thought about a situation, apply positive reinforcement. Remind yourself that there is no reason to be negative. Think about what makes you happy. You may feel helpless and/or worthless, but the truth is that you are not. There are many types of supplements and medications that can be helpful when combatting depression. Speaking with a doctor will help you to ascertain what medication and supplement you can turn to for help. Also, when asking–how do I know if I'm depressed? Speaking with a health care professional may help you to come to a definite conclusion.